My wife and I moved into our current house, along with the six cats, a little over two years ago. 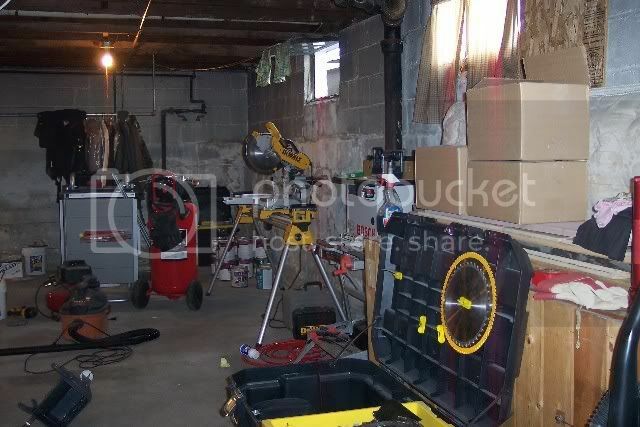 Since then the basement has served triple duty as 1) completely unorganized storage, mostly stuff from the prevous owners, 2) laundry room, and 3) my workshop. After two and half years of being frustrated with the mess we decided it wasn’t going to improve on its own and we needed to do something about it. So we moved all the big stuff that we figured we’d be keeping out to the garage, rented a 15yd dumpster and rolled up our sleeves for a weekend. We tore out the makeshift walls that were there, sorted through all the junk, and just kept tossing things into the dumpter until it was full. Here’s what we ended up with. 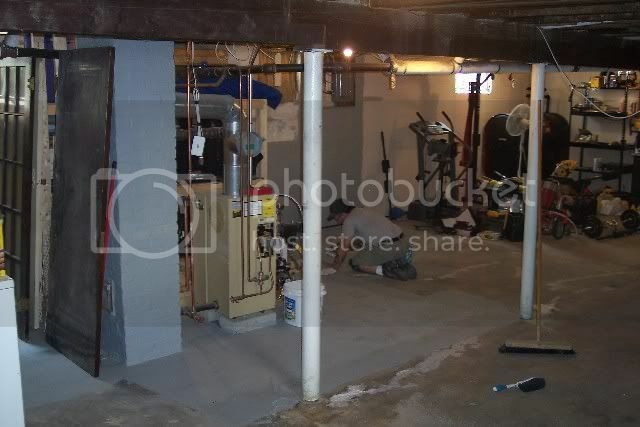 The house was built in the 1930’s and overall the basement stays surprisingly dry. But as you can see the walls are in need of some help. We did find a couple of areas with some minor seepage but those were quickly remedied with some gutter repair and concrete crack sealer. 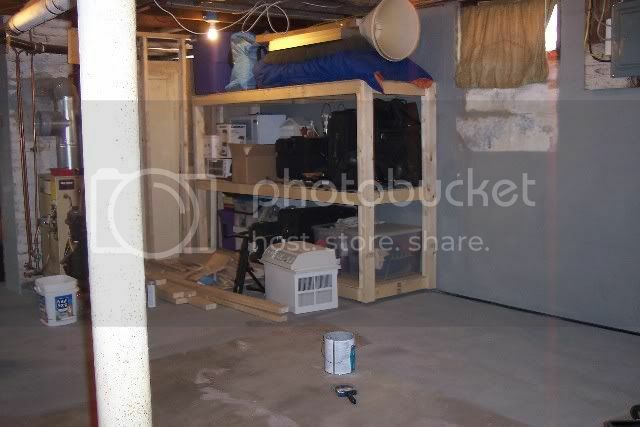 I wanted to get the storage area going first so I could get some stuff out of my way. 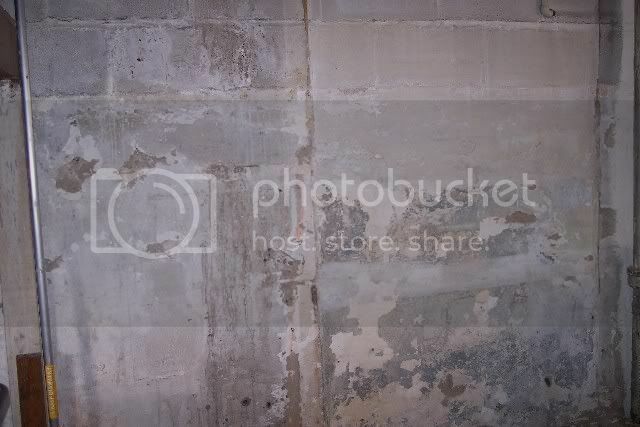 I acid washed the walls & floor and applied some Dry-Lock waterproofer just in case. 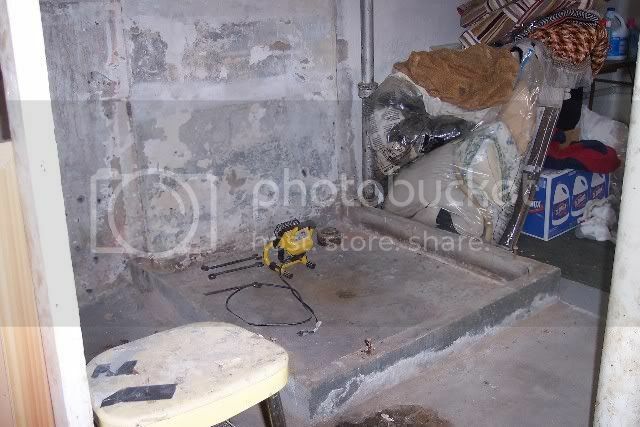 I used this in the area that used to be the shop and if nothing else it does a good job of keeping the concrete dust down. I found the doors off to the left of this picture propped up on some saw horses covered with a tarp being used as a table. One of them is the other half of the french doors that used to separate the dining/living rooms upstairs. The wall that used to separate them was removed turnng them into one big room and the other half of this french door was installed in the kitchen. I now have, what I think is, all the original doors to the house which just may find their way back home. I built shelves for the storage room and got some stuff up off the floor. I thought this was pretty odd. Before we started gutting the place, this was sort of a rag-tag shower. It was nothing more than some painted plywood nailed to a frame with a shower head and a floor drain. I had someone tell me that it’s pretty common in older houses built in “mill cities”. The husband would come home filthy from a day at the factory and would head to the basement and wash up before comming into the house. Not sure how true it is but it’s kind of a neat story. Either way I’m hoping for a 4” drain line in the floor. This is where the half bath is going and it would be nice if I didn’t have to bust up the floor. Here’s some of what used to be the shop which now serves as an area to toss stuff while I’m working on the rest of the place. sounds like you have made great headway on the transformation. The idea of “original doors” sounds interesting. And the shower – when we put our addition on the house I had a shower installed in the bathroom/laundry room so that my husband, a mechanic, could toss his dirty clothes right in the washer and have a shower, eliminating the dirt and grime from going any further into the house! Brilliant idea. I don’t think it ever happened. That shower dates back to the days when men actually worked. 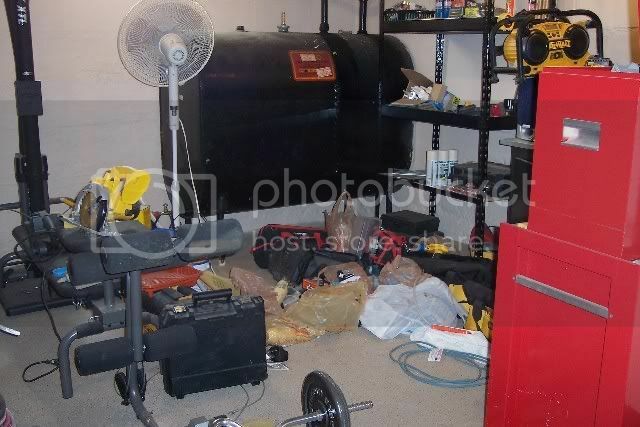 Shaun, it looks like you have made great progress on the basement. From the looks of it you will have a really dandy shop when you get done. It sounds like your wife is in favor of this project and that is always a great help. Keep us posted. We all like to watch. Definately, keep us posted. I’m curious as to what it will turn into. Any chance of seeing a floor plan drawing in the future? Now this is fun. Getting to watch a new and improved shop and living/recreation area grow from ruins. I think that when you finish your project I’ll invite you over for some boiled crawfish and we can start on my disaster area – I meant shop. Good Job cleaning it up and getting ready to improve it. Man, I worked up a sweat just reading about all the work you put in this weekend. Congrats on reclaiming the space! Looks like a fun project. Nothing like starting from scratch and designing all of your Ideas into a new shop. 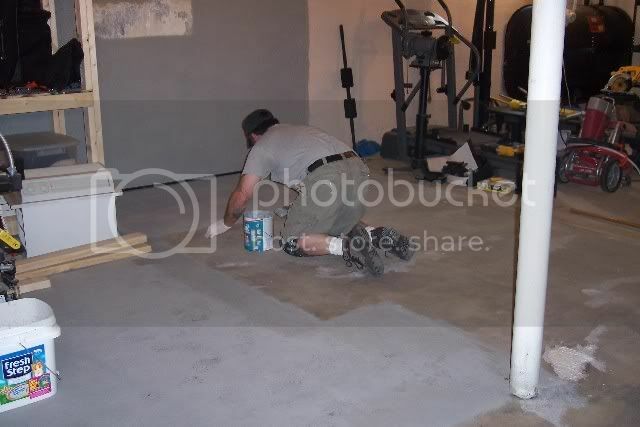 I painted my studio floor with epoxy before we moved in several years ago. It was some of the best money I ever spent. The epoxy covered floor is almost indestructible and it’s easy to sweep up shavings and dust. It’s also a lot lighter inside than the concrete would have been, which is an added bonus. Looks like you’ve got a lot of work ahead of you, but it will be really nice when you’re finished. Take care and all the best to you and yours! Great potential for this space! Thanks for the comments. The patio table I just finished generated another potential customer but this one is interested in seating for 8. If this ones comes through I’ll have another table to build and 12 chairs (still haven’t finished the chairs for the last set). Thank god neither one of them are in a rush until spring. I may end up putting another temporary set up together for the shop before the basement is done. This is a part time gig for me and I don’t get to build a lot of furniture, which is what I love to do, so I hate to loose jobs. Ms Deb – Having the original doors is kind of a big deal for me. The house was constructed back when things were built to last. None of this hollow core cardboard filled garbage. It would easily cost me a couple hundred bucks a door to replace them today. Thos. – Pam is the best. That woman has more patients with me than I deserve. She’s always supportive, willing to roll up her sleves when I need help, and drive me to the hospital when necessary. I’m still not sure what she see’s in me but there’s some questions ya just don’t ask ;) When she heard the story behind the shower she said “hey that’s not a bad idea, I might be able to keep the bathroom clean”. I eventually convinced her that the half bath would be better, but had to promise to wash up in the laundry room. Now I just have to keep her away from Ms Deb or she’ll find out that it doesn’t work that way. (mot) – you’re giving me way too much credit, that was more like 2-3 weekends. Blake – the joist supports are actually going to end up inside a wall. 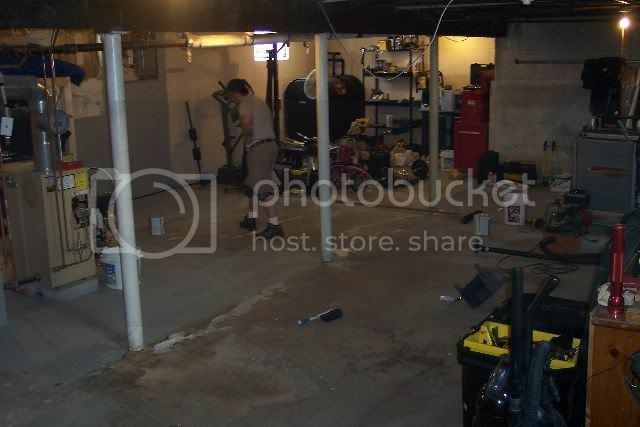 As much as I would love for the whole basement to be shop, part of this exercise is to add living space. We’ll be selling this one in a couple of years and want to increase it’s marketability. Steve – I put epoxy down on top of the waterproofer in parts of the old shop area and it is definitely going down again. Looks like the Pilgrim Fathers took all the ‘savvy’ with them when they left Plymouth. When will our Architects get the message and design houses to be built over a lined, open pit that we can convert to a basement. You lucky person you! I have to make do with a single size garage and leave the car on the drive! Mind you, the shop faces due-south so the metal doors keep the place real dry. My tools never rust, even if I use them! You have a nice shop growing up there. Yuor inspiring me. 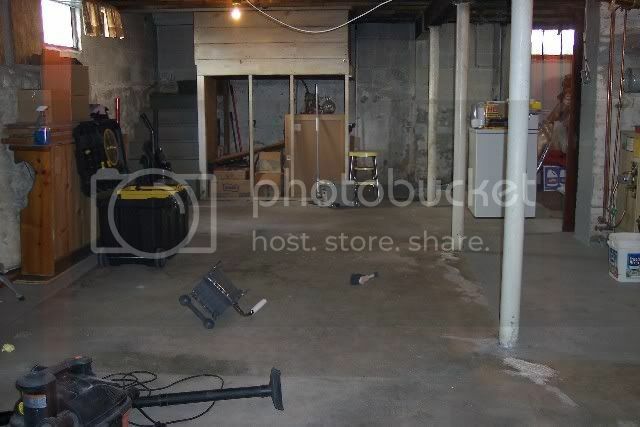 It is scarey when i look at these pictures, its almost like youve been in my basement taking pictures. I have planned to start the same process for over a year and have never gotten started, I may get started this winter.